They spent a year working for some of the most distinguished jurists in Massachusetts’ history. And, though that year may have occurred decades ago, many Supreme Judicial Court law clerks count that time among their favorite professional experiences. Now, those who have had the honor of serving the state’s highest court will have a society to join to maintain their bond with the court. At its May 22 meeting at the Andover Country Club, members of the MBA House of Delegates approved the new slate of officers and delegates to the HOD, voted on a number of significant proposals from sections and heard updates from General Counsel Martin Healy and Executive Director Abigail Shaine. MBA President Joseph P.J. 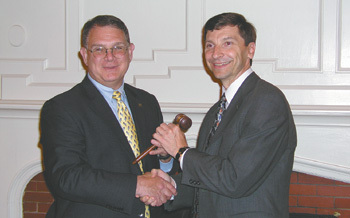 Vrabel (left) hands off the gavel to President-Elect Richard C. Van Nostrand during the House of Delegates meeting May 22. Leaders of the Massachusetts Bar Association brought significant legal issues to the attention of congressional leaders on Capitol Hill during the American Bar Association Day on April 29-30. Starting a firm: Where to begin?